Five years ago Aquatica Orlando opened and changed the way that SeaWorld Parks and Entertainment builds waterparks. 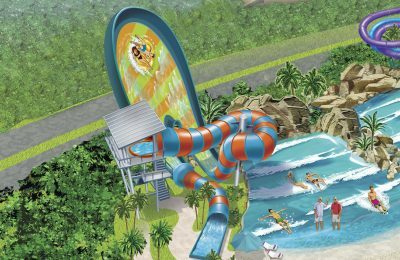 Promising to “slide by the sea” Aquatica opened signature attractions that you can’t find at any other waterpark in the United States. Sliding next to rare Commerson Dolphins, the waterpark has fast become a must see destination in Orlando, and a great way to beat the Florida summer heat. For their fifth birthday, the first SeaWorld waterpark is treating Florida residents to a huge discount. On March 1st, Aquatica will turn 5 years old. To celebrate, the park will offer Florida Residents a one day ticket for just $5 dollars. Florida residents and up to five guests can enjoy the thrills of Dolphin Plunge, the relaxation of Loggerhead Lane or take the little ones for a dip in Walkabout Way. On March 1st, 2nd and 3rd the park will allow Florida Residents in for just $5 dollars. *Update-According to the park website, the $5 dollar ticket is sold out for all three days. Keep your eyes open as more may become available, though at just $5 dollars, it’s very unlikely. Everyone in the party must be Florida Residents and there are only a limited number of tickets available each day.